‘Emotional’ eating relates with craving specific foods according to our emotions. There are many theories on why people ‘emotionally’ eat such as deal with specific emotions, feel better, to avoid dealing with a situation by eating and so on. It is an individual thing. There is also a difference between physical hunger and emotional hunger. Studies suggest that physical hunger starts slowly and intensifies with time and can have physical symptoms such as stomach ‘growls’, hollow feeling, headaches or nausea and any food will do. my name is Shantel. Let me start off by telling you I’m in the military and that’s where my problems have stated. I’ve always been an average size 8, 135 pounds; that’s how I was when I entered basic training in April 2010. During basic I fractured my pelvic bone and was put on limited activity. I did what I could to pass basic and then I did what I could to pass Advanced Individual training (AIT) but when I got to my duty station in Fort Drum I started packing on the pounds. Because of how I “pushed through” all my training I’ve also ended up with cartilage tears in my hips, knee problems and back problems and I was again put on limited activity. Right now I’m a size 13 and 170 pounds. I have a hard time giving up my “comfort foods” because of the stress and depression I have because of my weight. My self esteem and motivation are really low at this point and I need help finding a cheap, low impact way to get back in shape. From what I can gather from your email your body has been under a lot of physical and mental stress the past year. The first thing I would recommend you do is take things slowly and give your body a break. Military training can be hard and is not always ‘body’ friendly. One of the aims of military training is to achieve high levels of fitness and prepare people to deal with extreme circumstances. Such training can put considerable strain and stress on the body and it can result in injuries or increase risks. Although is not wise to push yourself through injuries, as you may have discovered, you should credit yourself for showing determination and puling through such hard task. I gather that while on your basic and advance training you were extremely physically active and you did stay in good shape. If I am right to say when you moved to your duty station your physical activities decreased radically especially with having further injuries and complaints. It is quite natural to put on weight or have decreased fitness levels when stopping exercising, as your body is used to burning larger amounts of calories through physical activity and also with losing muscle mass you can decrease your metabolic rate (rate by which you burn calories). The points I can suggest that need addressing are your psychological/emotional state and your fitness in respect to the injuries and health issues. Below I have summarized a few weight loss tips and some more information for these things. Understandably you have been under a lot of stress and strain this last year having to deal with completing your training and all the high demands involved with it and having to deal with all the injuries you had. As I said earlier a good starting point is to give credit to yourself for all your achievements and concentrate in recuperating and relaxing. I understand that you feel down about your shape and you have low self esteem and depression. However, you have achieved a lot of things and have worked hard through this year and a lot of the problems with putting on weight are due to the physical injuries, which by all means are not easy to have to deal. Therefore, you should feel proud of yourself for all you have done and not a lot of people would have gone so far. Sometimes emotions and eating can create vicious circles. I have put the bellow diagram to explain what I mean. Diagram 1. 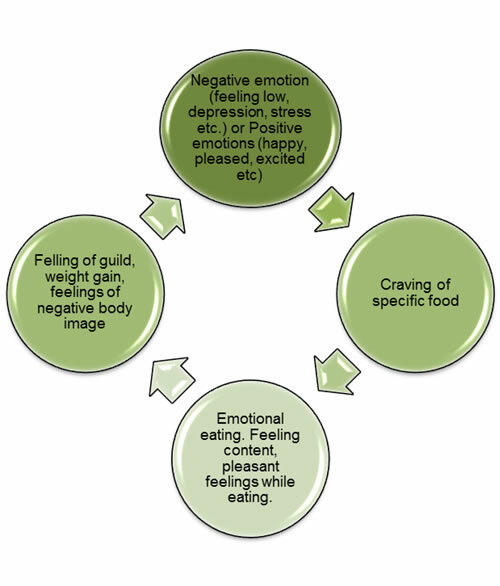 A cycle of ‘emotional eating’. ‘Emotional eating’ can be triggered from both positive and negative emotions. A number of theories have been developed to explain the reasons people ‘emotionally eat’. For example ‘emotional eaters’ will eat foods to maintain a positive emotion or to escape/deal a negative. If there is counseling available in your duty station I would strongly suggest that you do use it. Having counseling does not mean that you can’t cope, or there is something wrong with you. When going through some hard and stressful situations it does help to talk about it. Counselors are professionals and can point you to the right direction in dealing with your feelings and the situation and making changes in a way that friends and colleagues may not have the skills to do. Keep a diary of all the foods and drinks and calories if possible, you have for a week and right in it the emotions you feel before, during and after you had that food. ‘Emotional’ eating relates with craving specific foods according to our emotions. There are many theories on why people ‘emotionally’ eat such as deal with specific emotions, feel better, to avoid dealing with a situation by eating and so on. It is an individual thing. There is also a difference between physical hunger and emotional hunger. Studies suggest that physical hunger starts slowly and intensifies with time and can have physical symptoms such as stomach ‘growls’, hollow feeling, headaches or nausea and any food will do. Emotional hunger tends to be a craving for a specific food and tends to start suddenly. You can ask questions to yourself to help you such as do I crave a specific food? Do I have any physical symptoms of hunger? Do I feel full but still want to eat that food? If I have a glass of water does hunger subside? (Thirst sometime can feel like hunger). By keeping a diary you can see when do you eat emotionally, which foods do you chose, what time of the day and what emotions are linked to which foods and do you really feel better or worse? By understanding how you eat and what you eat it will be easier to break the cycle of emotional eating and give up on ‘comfort’ foods. 1. To start off substitute ‘comfort’ foods with healthier options. For example if you are craving sugar, chocolate etc sweet foods have a fruit or some dry fruit and nuts. They will still provide you with the sweet taste but the will be a lot healthier and less calorific. Do keep in mind that dry fruit and nuts do contain a lot of calories so just have a handful. If you can’t get over the craving for a particular food then have only a small portion of it. Try to keep comfort foods (i.e. chocolate) in portion small portion bags and if you must have some then have only 1 small portion. It is best to try and dissociate feelings from food slowly. So when you feel you can try replacing the craving with a cup of tea or another activity. 2. This brings me to the next tip. When you feel emotionally hungry try doing another activity which will make you feel good. For example have a pampering bath, or go for a walk, do your hair, read a book, talk to a friend. What will work will be entirely up to you. Whatever you do, try not to linger on the negative emotion or thoughts. For example if you feel low because you don’t fit in a dress don’t start lingering in the thoughts of you wished you looked like you did before, and that you don’t like your body etc. If you don’t fit in the dress plan for things in the future for when you do fit in the dress and do something to take your mind. Make a list of alternative activities that you can do that make you feel good and take your mind of negative thoughts. These could be knighting, gardening, crafts, making a personal journal, making cards, drawing, walking, playing cards etc. An idea could be taking on a hobby. Why not try different classes, languages or flower arranging, or ball dancing (always check with your doctor if a physical activity is recommended for the injuries). Put the list on fridge door and carry one with you, so when you feel like eating pick an activity from the list. 3. Try to deal with the emotions. This is where I will say again that if you can do some counseling then do. There are techniques to self help and self deal with emotions however, due to my knowledge limitations in that aspect I could not recommend one over another or give you that guidance. If you do have access to someone who can advise you further then do. You can replace the behaviors but unless you find the root of what makes a behavior happen it will not disappear. If you feel low you may not comfort eat but unless you find the reason why you feel low and deal with it this won’t change. In terms of following a diet to lose weight. Do take one thing at the time and do not overload yourself with expectations and goals. If trying to cut down on comfort food and dealing with cravings is too much doing try to follow a weight loss diet as well at the same time. In general I would suggest lowering your calorie intake by 500 – 1000 calories to start off. From your food diary you can see how many calories you consume per day. You can make simple changes such as minimizing snacks or replacing them with healthier options, such as fruits, nuts, vegetable sticks or some protein. Try to minimize or avoid completely sugary and fizzy drinks (that includes some ready juices), sugary milky coffees and hot drinks, sweets and biscuits. Reduce your carbohydrate intake by reducing bread, pasta, potatoes, pastries and rice. Increase the amount of protein you eat such as meat, fish, eggs, and dairy. Some dairy can be very high in fat, do have then but in moderation. You will find that you can reduce your calories without being hungry with these small changes. A steak with a sauce and big salad can still be very tasty but with a lot less calories that if you had chips or potatoes with it. Have a protein based breakfast. Protein can make you feel full for longer. Carbohydrates can make you feel craving for foods, so if you have protein can also help with craving sugars and comfort food. Avoid takeaways, fried foods, readymade meals and processed foods they can contain a lot of trans fats. They are high in calories and not the healthiest. You could keep a treat once a week if it is too hard to give them up completely or be quite calorie strict when eating them. If you have to have more than one takeaway per week then has a very small portion. It is not the healthiest way but taking slow steps is better than none at all. Avoid sandwiches for lunch. If you going to work every day then take a packed lunch. Examples could be an omelet and salad, some tuna and salad or some vegetables and maybe a slice of bread with it, or just opt for a salad, or a baked potato with tuna or soup from the canteen. Undoubtedly increasing your physical activity/exercise can help with feeling better and losing weight. First do consult your doctor regarding what exercises you can do. I can give some suggestions but you must check that any exercise you take does not contradict with your injuries. I would assume that with your injuries you would have been seen by a physical therapist (such as a physiotherapist) to carry out a rehabilitation program with you. Any exercise you do should be in line with the stage in your rehabilitation. If you have not been seen by a physical therapist then I highly recommend consulting one. I would presume that such services would be available to in your duty station or through the military? It is important that any injuries are rehabilitated accordingly in order for structures to heal properly and correctly and not increase risk for further or future injuries and health complaints. 1. Pilates is a low impact exercise and it can help with conditioning the abdominal and back muscles. Pilates have been suggested as treatment for back pain. There are not a lot of studies available but those who are do seem to show positive results. They may also be beneficial in reconditioning your hips and upper legs. In rehabilitation for hip cartilage tears exercises which increase hip range of motion can be recommended. Often hip flexions sitting on a gym ball are also recommended. However, it does all depend on which stage of rehabilitation you are and what does your physical therapist will approve. Do not by pass them as you could cause more injury if not appropriate for this stage! 2. Static cycling and not in a high level could be good. Again do check with a therapist that they are appropriate for your knees. Moreover, you can try swimming or hydrotherapy if you can have access to it. Body weight resistance in the water decreases however, you still have the resistance of the water, so you can work out without putting too much pressure on your back, knees or hips. 3. Static upper body exercises. You could do a variety of upper body static exercises given that you do not add pressure to your back. Things such as bicep curls, weight exercises for triceps, chest and shoulders should be safe as long as you perform them according to your level of fitness and ability, perform them correctly, and after a suitable warm up session. One of the issues with home exercise suggestions is performing exercises correctly and to your own level. If you have access to a trainer, do ask them to show you how to perform the exercises to ensure you know the correct technique. Especially if you have previous injuries as they could be more harm if not at the appropriate level or technique. Sometimes it may be enough to have 1 session with a personal trainer who can shape exercises to a daily program and show you how to do them, and then carry on by yourself. Finally, with starting any new diet it is wise to check with a medical professional especially if there are any pre-existing medical complaints. I hope this answer is of some help to your inquiry. If you have any further questions please do contact me.